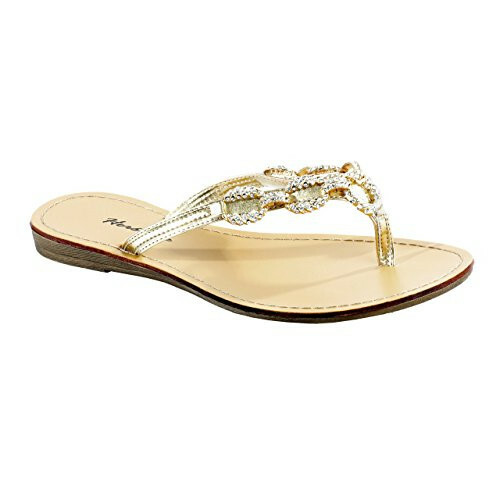 Time to add a little zing to your flat sandal selection, and the best way to do that is with a little bling. The Janiesa's black, silver or gold colors all highlight its metallic toned chain-link style accent, which is then topped with sparkling rhinestones for further flash. It's a lot glitzy and even a little ritzy, making it the ideal sandal for when you need to brighten your day - or when you just want that extra kick of fun in your life. Available in sizes 5 to 11. I love this flat thong sandal!! I will say my friend Shanine bought this sandal bought her normal size. She told me that it was a little tight. However, I bought a size .5 bigger than my normal size and it turned out beautifully. So I recommend that if you are a half size, do not hesitate to go up.